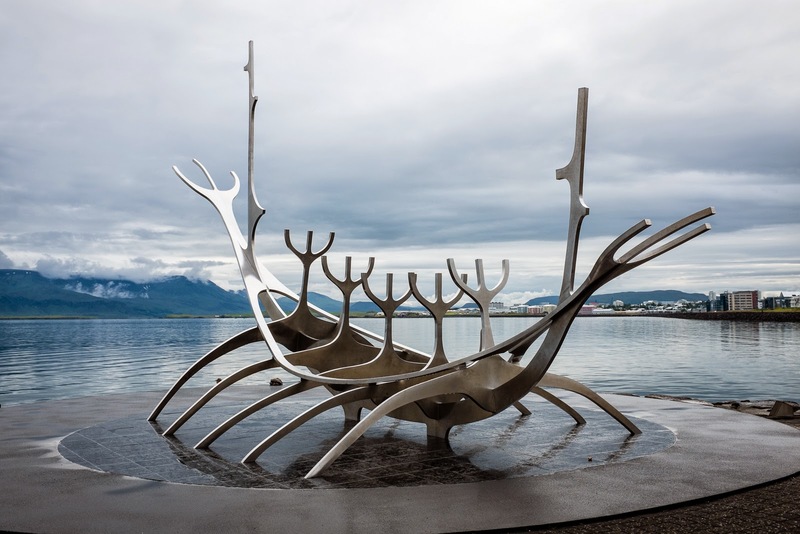 Our flight from Belgrade arrived at Keflavik Airport in Reykjavik, Iceland, just before midnight. Fifty seven years earlier, this is where my father was based. When I was 3 and my brother 1-1/2, my father spent one year of our lives in Iceland with the USAF at the Keflavik NATO base. We were not with him. I remember seeing black and white photographs of him in his fatigues standing in the snow--such a young, handsome man. Flying above the clouds, the sky was clear and sunny with a peachy glow like a sunrise or sunset. Once on the ground, the brightness dwindled to very gray. The land between the airport and Reykjavik, though hard to distinguish in the grayness, is a bumpy, crusty lunar surface. 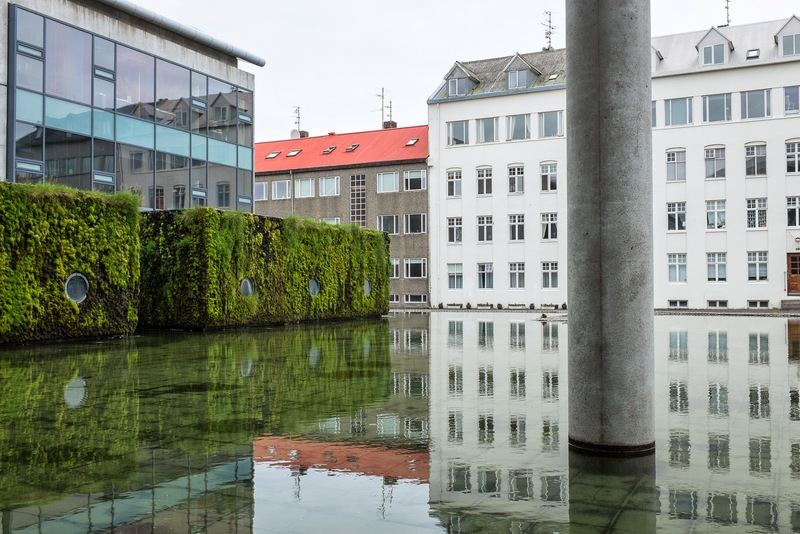 The first day in Reykjavik, we just wandered the downtown area and took photos. The weather was overcast, but there was no rain while we were out. 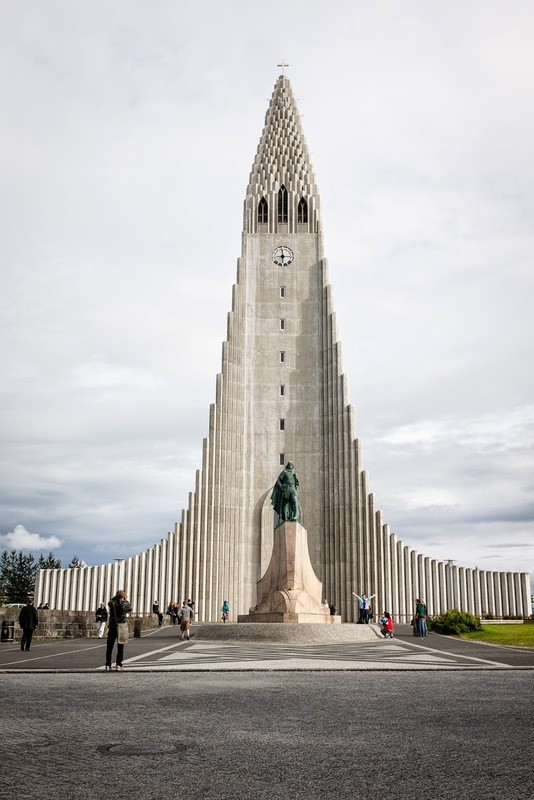 We visited the ultra modern Lutheran Church, Hallgrimskirkja, built in the 1930s to mimic the columnar basalt found in the landscape. The interior is neo-gothic modern--very lovely. 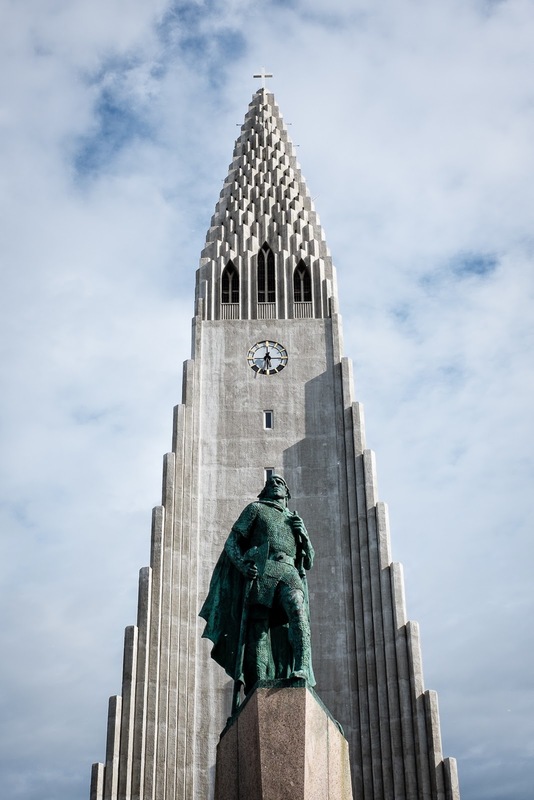 Alexander Stirling Calder (the father) sculpture of Leif Eriksson (a gift from the USA) stands in front of the church. In a big change from the Eastern European countries that we have lately visited, smoking is not allowed inside any building in Iceland. We saw very few people smoking outside. 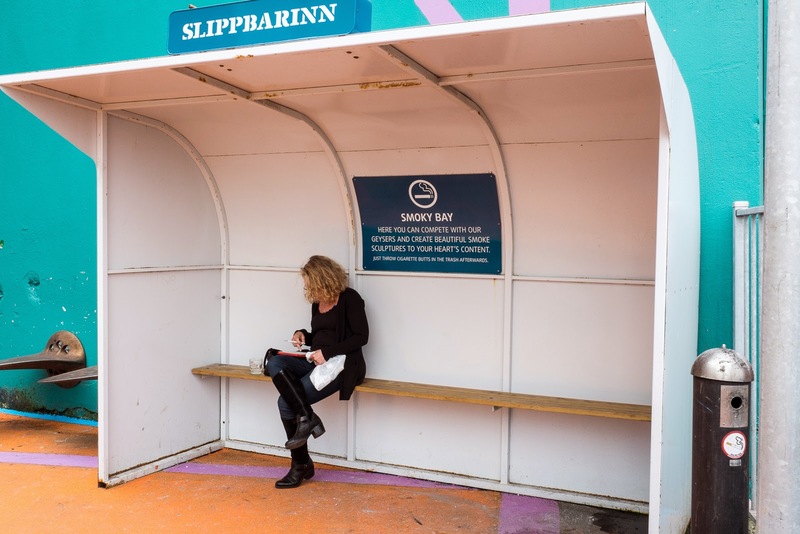 For those few smokers, there are some smoker accommodations like this clever "Smoky Bay." 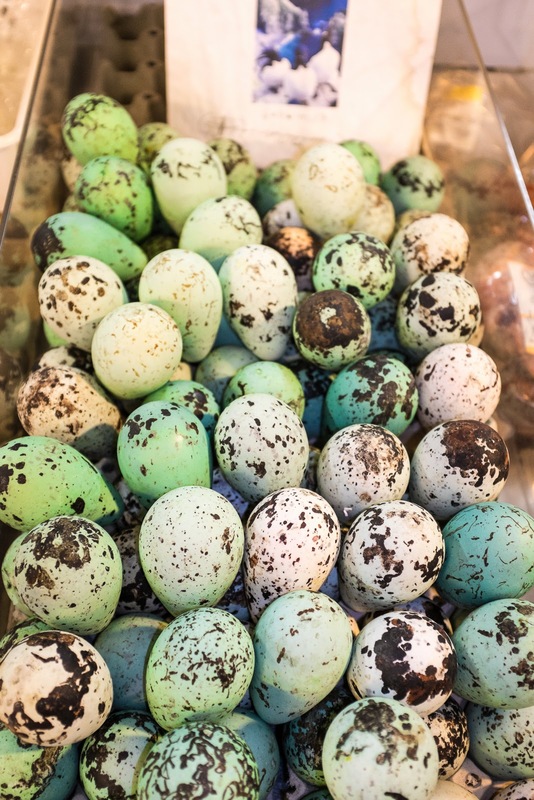 The flea market sold lovely speckled, blue eggs from guillemots, lots of dried fish, homemade breads and pastries, and sausages made from horse meat. Iceland is a whaling country and one of their piers had whaling ships on one side and whale watching boats on the other. 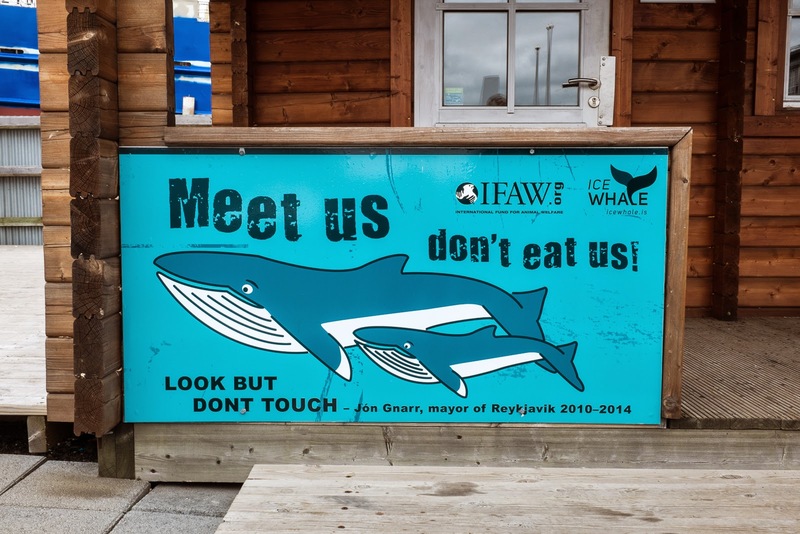 Away from the port, signs ask diners to not eat whale while restaurant signs show "Minke Whale with Cranberry Sauce" as an entree. 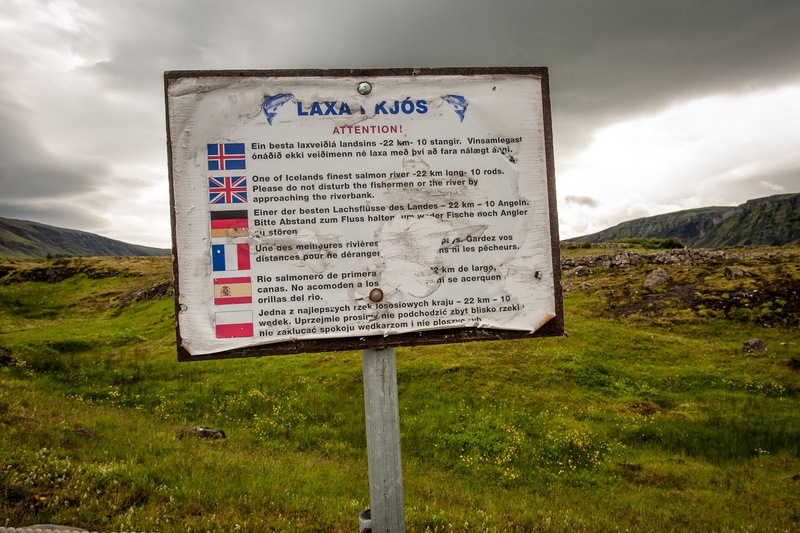 That night, we attended a comedy performance called "How to become Icelandic in 60 minutes." It was mostly funny. 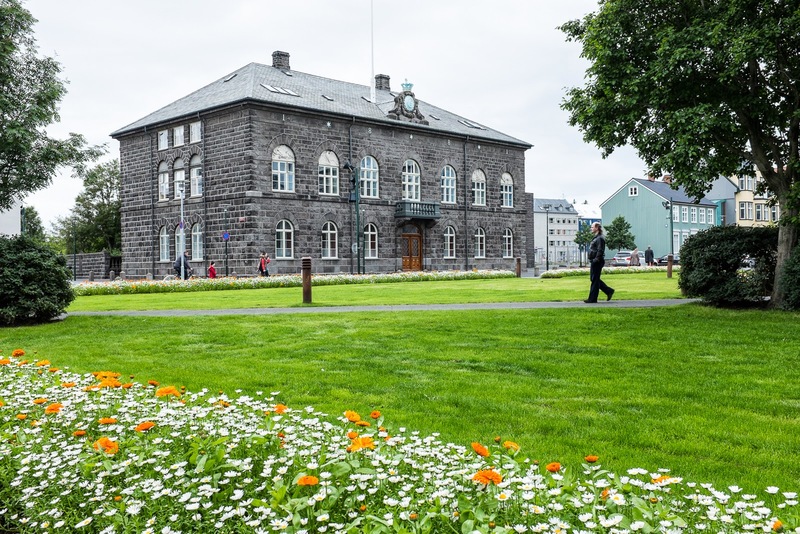 We found that there are about 320,000 inhabitants and 14 political parties in Iceland. 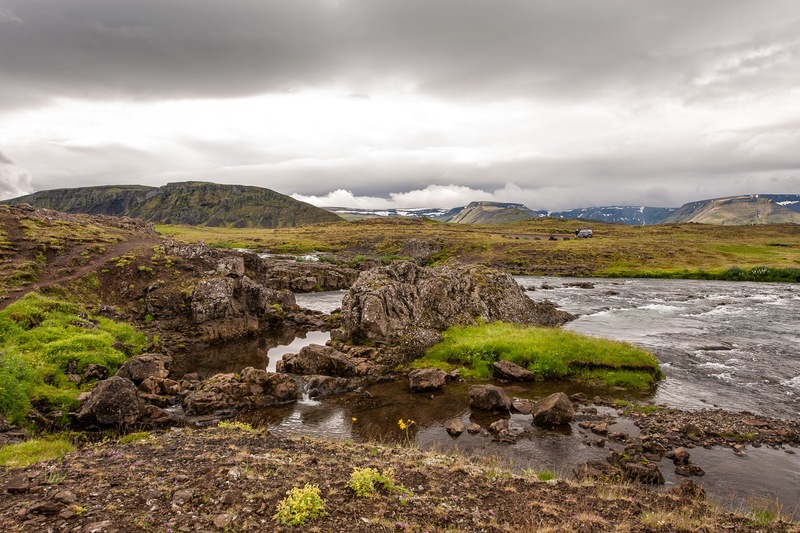 After all the self-deprecating humor, the comedian showed slides of stunning Icelandic landscapes with blue skies and sun saying that "this is why Icelanders stay." Then, we ate at an Italian restaurant that did not serve whale--or puffin--or horse. The next day, we hit the road for our drive around the island--it sprinkled off and on. While whales are not protected, fishermen are. At one lovely river, a sign requests that neither the fishermen or the river be disturbed. The riverbank was roped off to protect it from tourists. 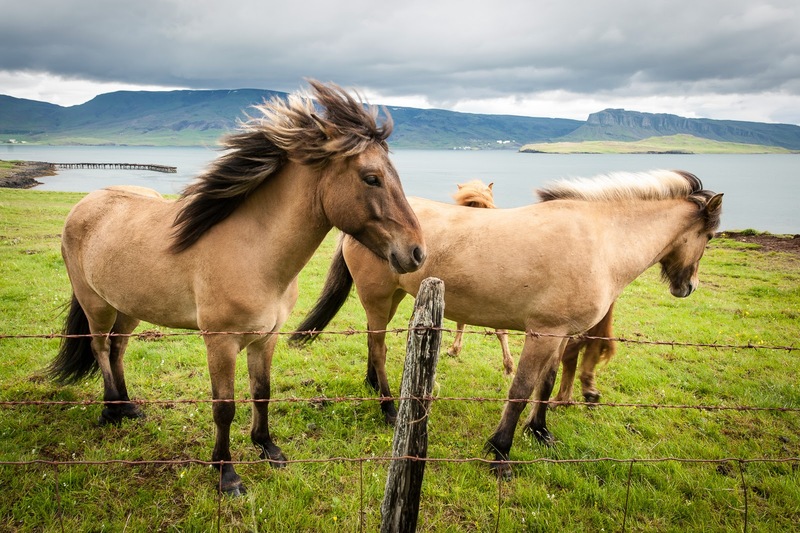 In the 1000+ years since horses were brought to Iceland, an Icelandic breed has developed. They are sturdy beings suited for a wild climate. 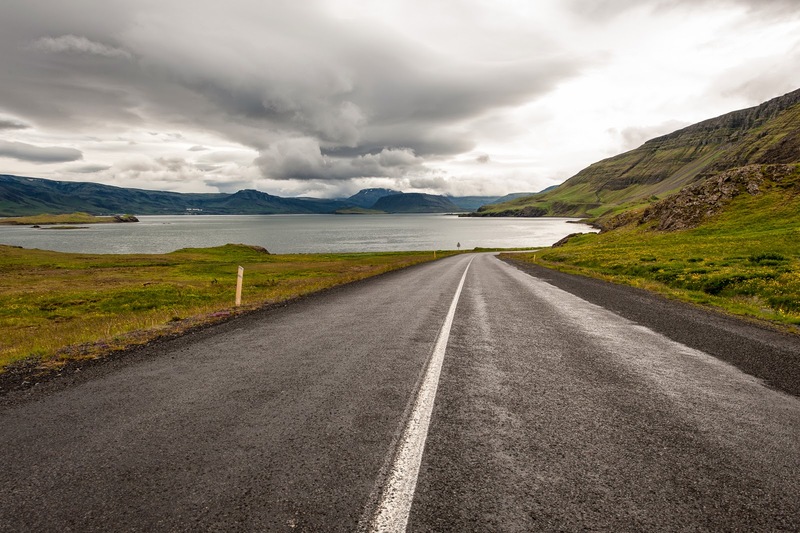 There are now about 80,000 horses on Iceland. At the restaurant we stopped at for lunch, the young waiter told us that two years ago the temperature in July was as high as 20 C (68F) once. 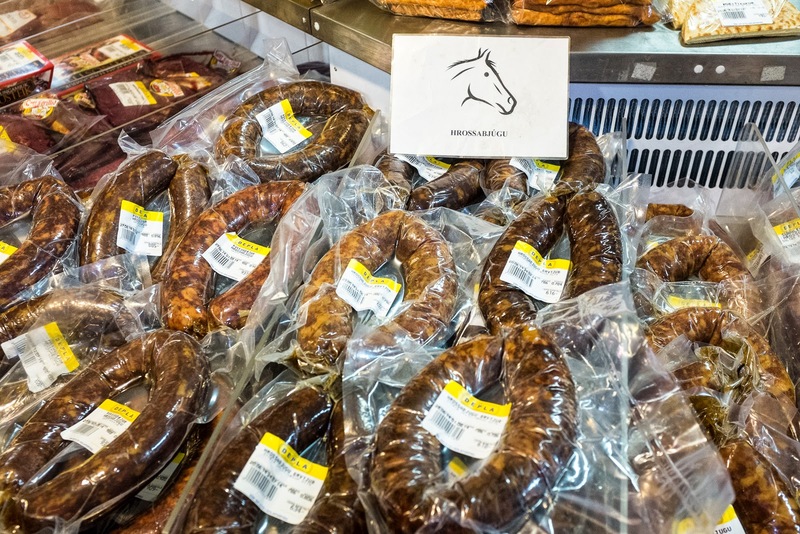 We ate dinner at our hotel; Dan ate a horse--not the whole thing, just a horse steak--another tic mark on his bucket list of animals eaten. The dark skies make dramatic photos, but it would be nice to see the sun. Arriving at the Sarajevo airport, we rented a car and drove the 2-1/2 hours to Mostar. 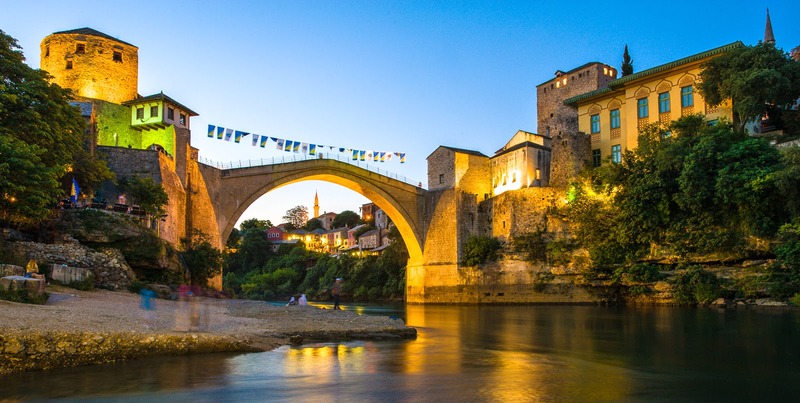 Specifically, we wanted to see Stari Most (Old Bridge). The bridge we saw is Version 2. The original bridge was built almost 500 years ago by the Ottomans. 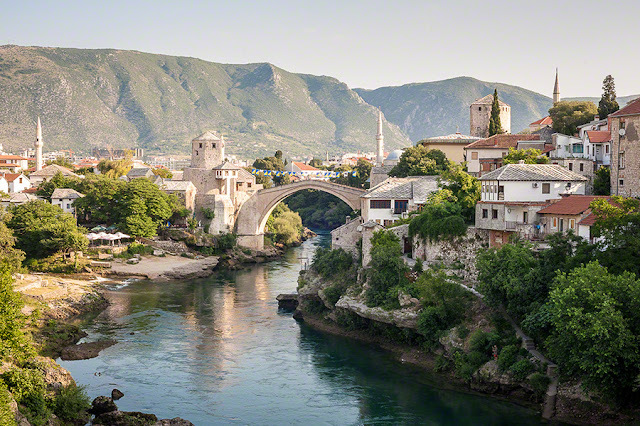 Stari Most joins the čaršija (old town) of Mostar which lies on both sides of the Neretva River. Mostar is named for the Mostari which means bridge keepers. 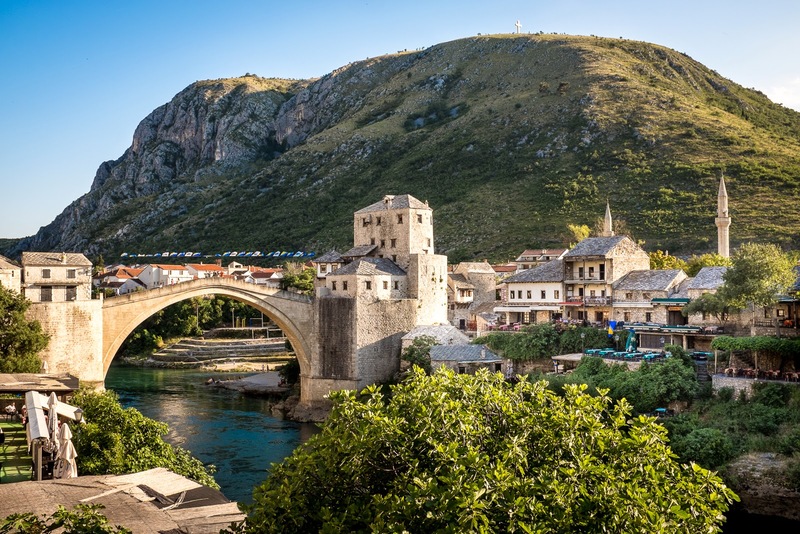 The Mostar Bridge was built in 1557 by architect Mimar Hajrudin, a disciple of Sinan, the father of classic Ottoman architecture. It was made with 456 blocks of white stone, held together by a system of anchors and dowels. Two fortified towers protect it: the Helebija tower at north-east and the Tara tower at south-west..., Upon its completion, it was the largest single-arch bridge in the world. 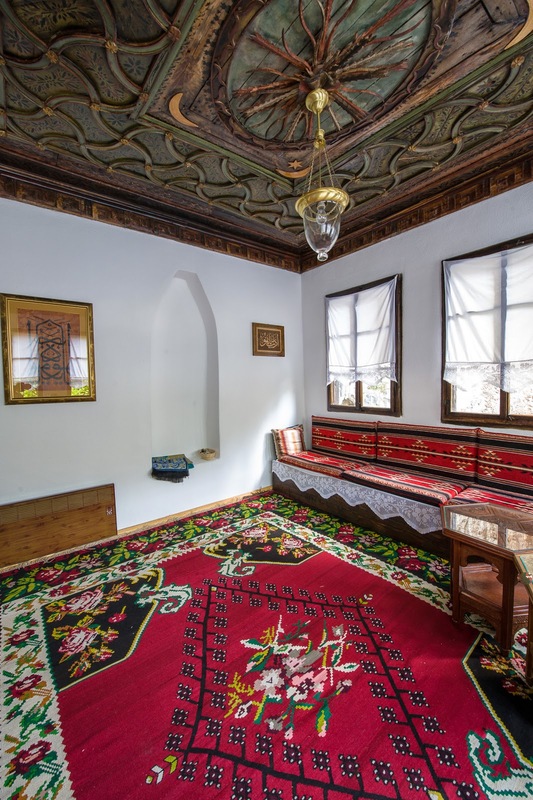 (Osservatorio Balcani e Caucaso's page on Mostar: the Old One, twenty years later). During the 1992-1993 siege of Mostar, after all the other bridges in Mostar had been demolished, Stari Most became the next target. On November 9, 1993, after two days of shelling, the Stari Most was destroyed by Croatian forces. Eleven years after its destruction, the bridge was rebuilt in 2004 with financial assistance provided by many sources (United States, Turkey, Italy, the Netherlands, Croatia, ...). The official opening of Version 2 was on 23 July 2004. 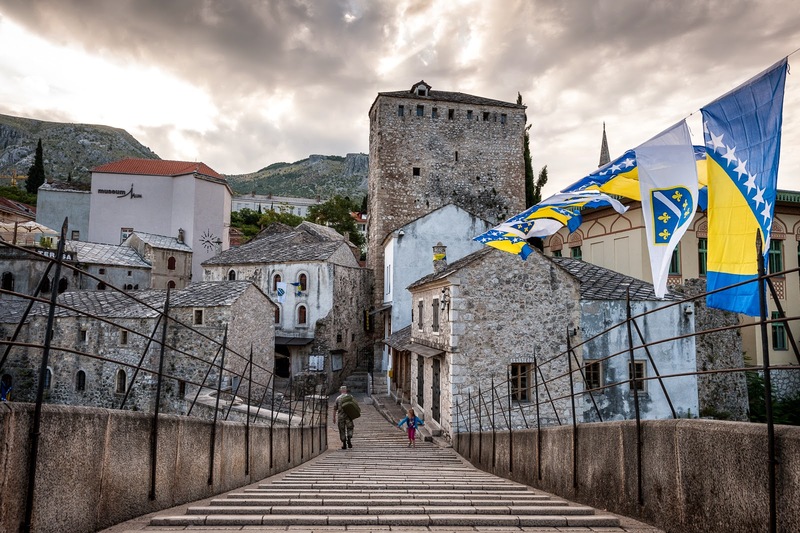 Next month, some inhabitants of Mostar and the international communities will celebrate the anniversary of Stari Most v.2. Looking southwest, the hill that towers over the Stari Most now has a cross on it. Like so many of the cities in former Yugoslavia, the cross was erected here in 2000. 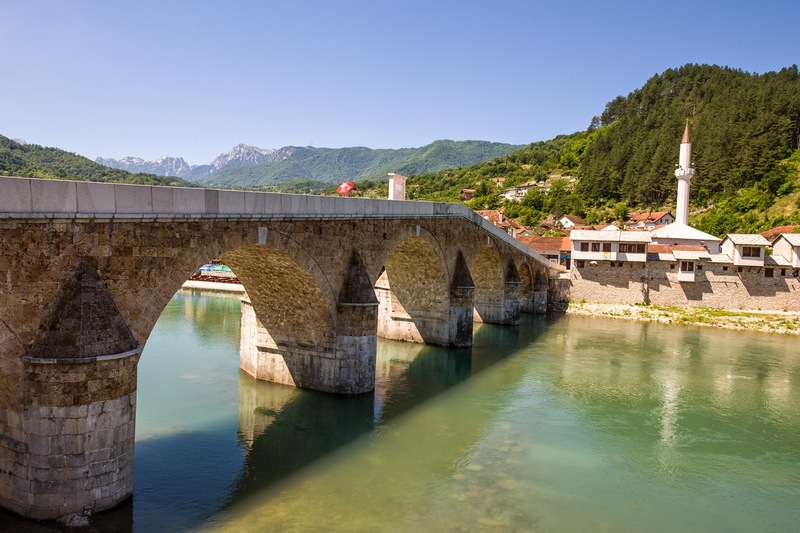 On the way to Mostar, stopping at the city of Konjic to take a break, we found another old Ottoman bridge over the Neretva River, built in 1682, that had also been destroyed by war. The war in question was WWII and the perpetrators were Germans. The Turkish government restored this bridge in 2009. 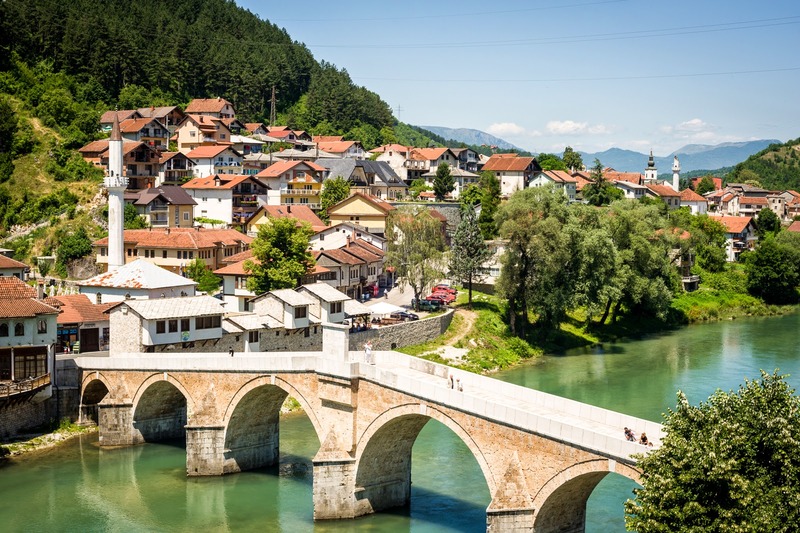 The bridge connects the territory of Bosnia to that of Herzegovina. 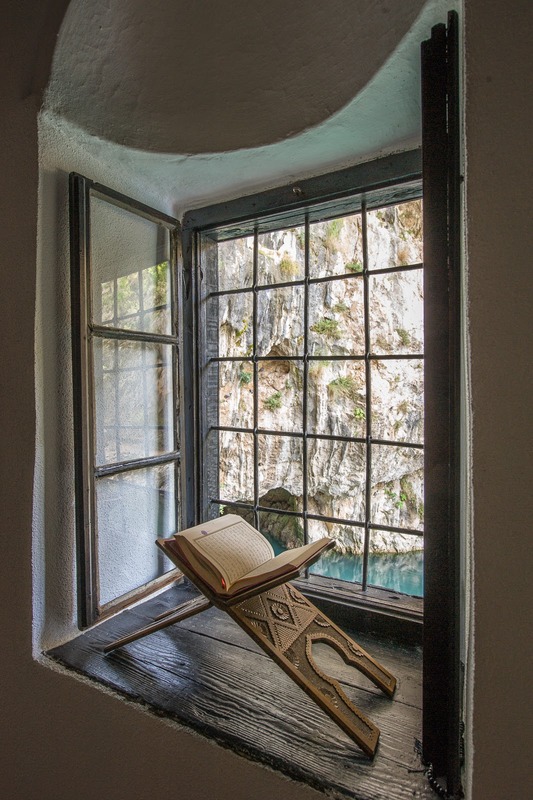 Driving back to Sarajevo, we stopped at Blagaj to visit the Sufi Tekija (house of dervishes). The tekija built in Ottoman/Turkish Baroque style in the 17th century is nestled next to and under a sheer 200-meter rock-wall face. There has been a tekija here since at least the 15th century. It felt like a good place to escape from thoughts of ethnic wars. 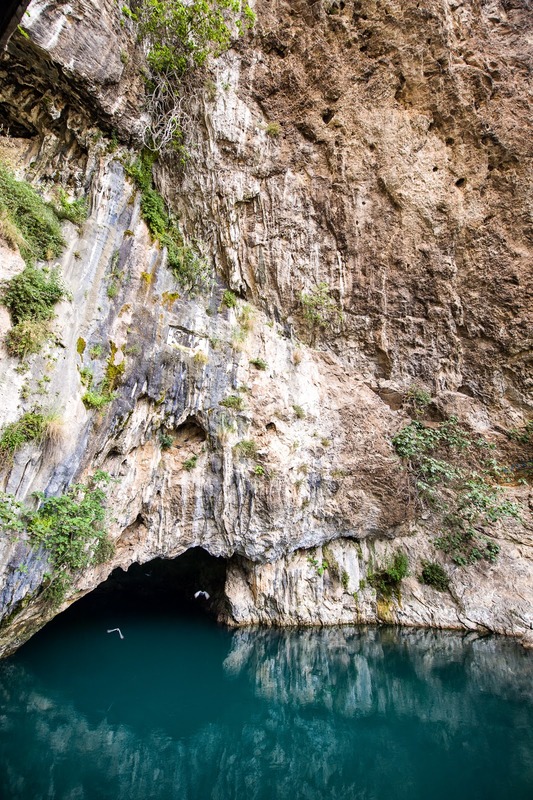 The source of the Buna River (a tributary of the Neretva River) is inside of the small cave that stretches far into the mountain. The powerful karst spring produces water at the rate of 43 meters per second (96 mph). The sound of water is everywhere. One of the Koranic quotes at the tekija is "We made every living thing from water" (Al-Enbya:30). Being here in the tekija, you can feel the water running through your body. It felt peaceful so we lingered. 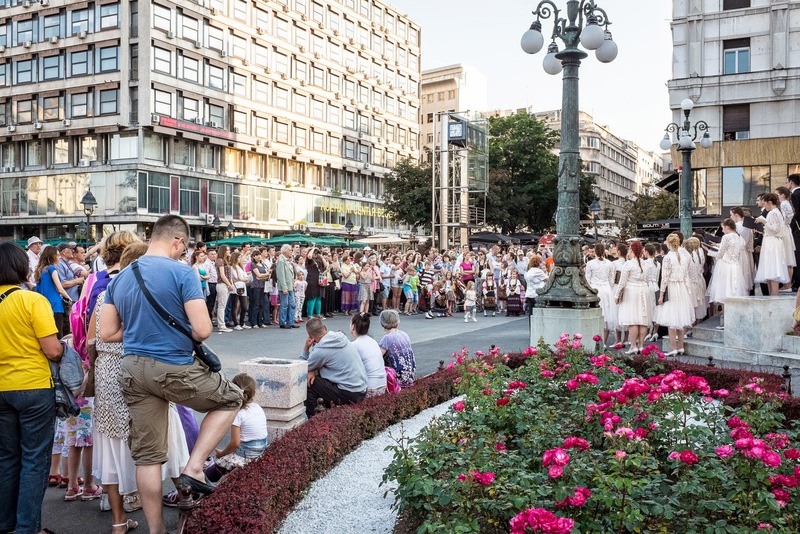 Our second week in Belgrade was uneventful until Friday. On Friday morning, we began the day early with a 2-1/2 hour drive to Niš. 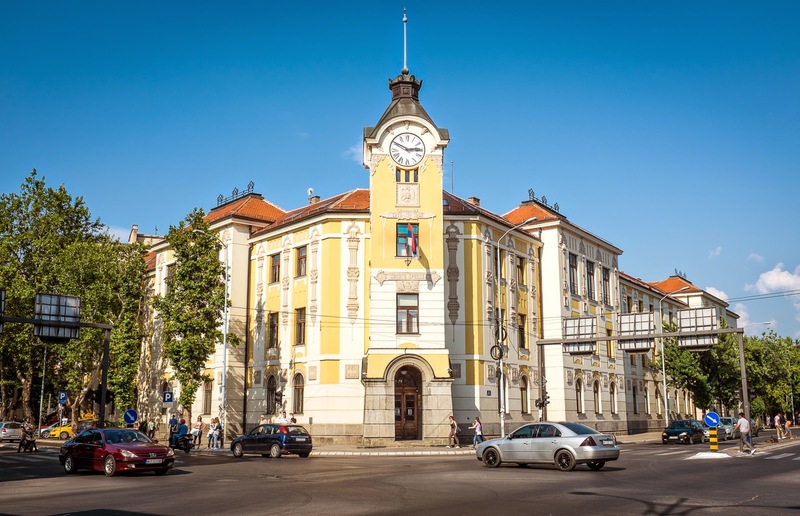 Dan had been invited to a Plea Bargaining conference arranged by Partners Serbia at the Niš courthouse. I was just along for the ride, so for about 6 hot hours I was a person without a roof over my head. I wandered the pedestrian street and Niš Fortress until the conference ended. 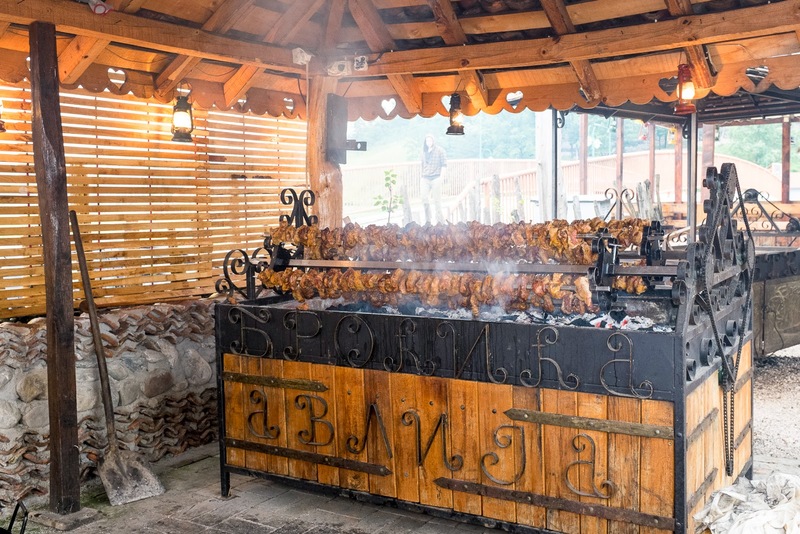 Next, we were driven another 2-1/2 hours to Čačak (pronounced Chachak) in west central Serbia to attend a dinner sponsored by the regional bar association. We didn't get to see much of Čačak beyond the hotel and restaurant which is too bad because the area is known as the "Serbian Mount Athos." 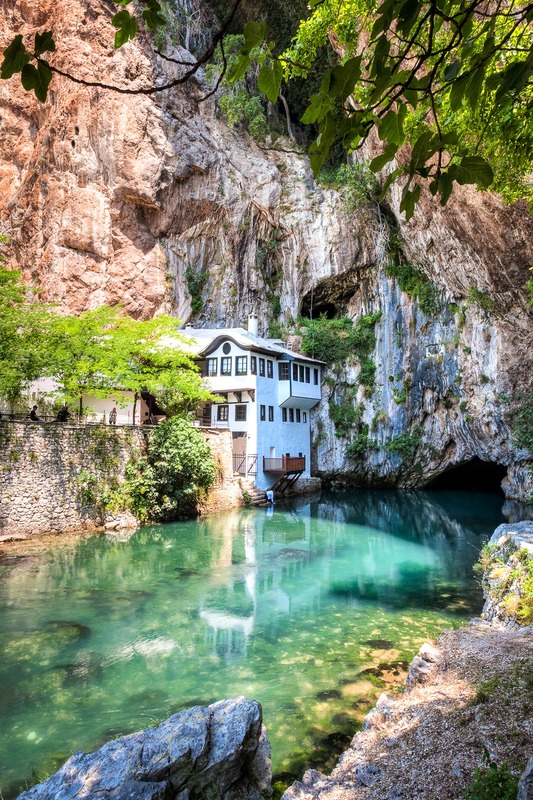 Beginning in the 14th century, eventually about 300 monasteries were built along the river gorge. 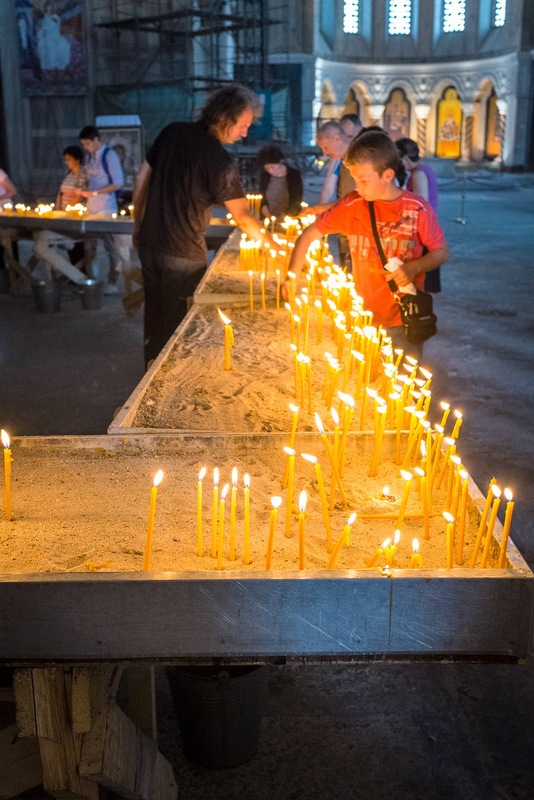 Today, 12 monasteries survive. We arrived at the restaurant about 9:00 pm. About 50 lawyers attended the dinner Friday night. Except for the musicians, I was probably the only non-lawyer. 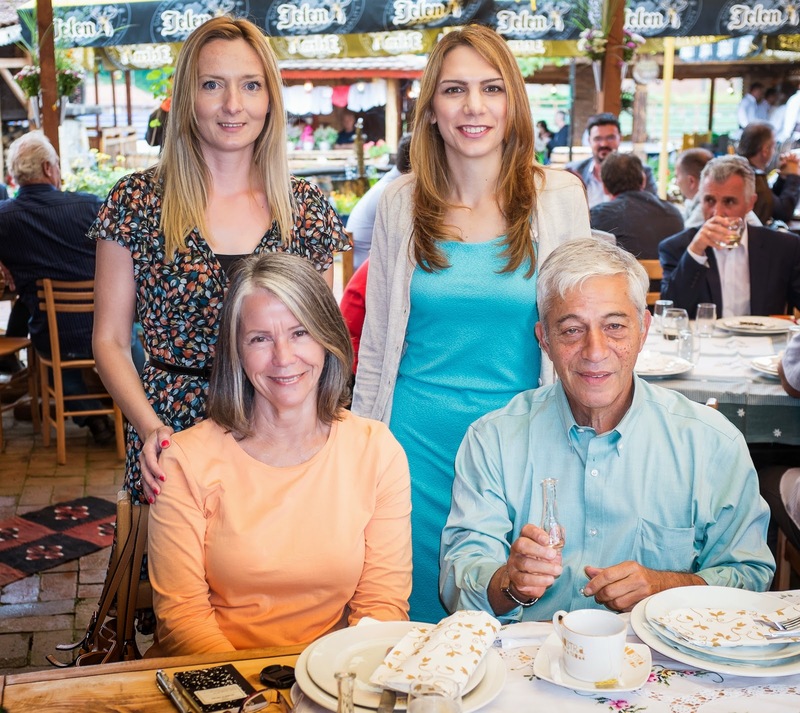 The president of the Serbian Bar Association was a guest as was the former president of the Macedonia Bar Association. Drinks were poured, dinner was served, and musicians played. 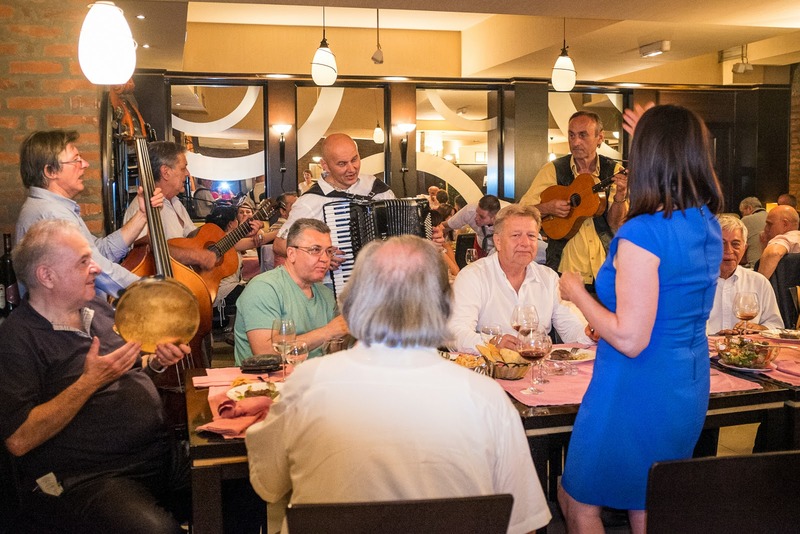 While the musicians played tragic love songs, the dinner guests sang. It was impressive that the entire group knew the words to all the songs. Songs from every part of former Yugoslavia, Hungary, Romania, and Russia were sung. Dan and I left the gathering about 11:30 pm and the musicians and guests still had not taken a break. The next morning we woke to rain and cool weather. Dan's informal polling found that many of the lawyers did not quit the party before 3:00 am. 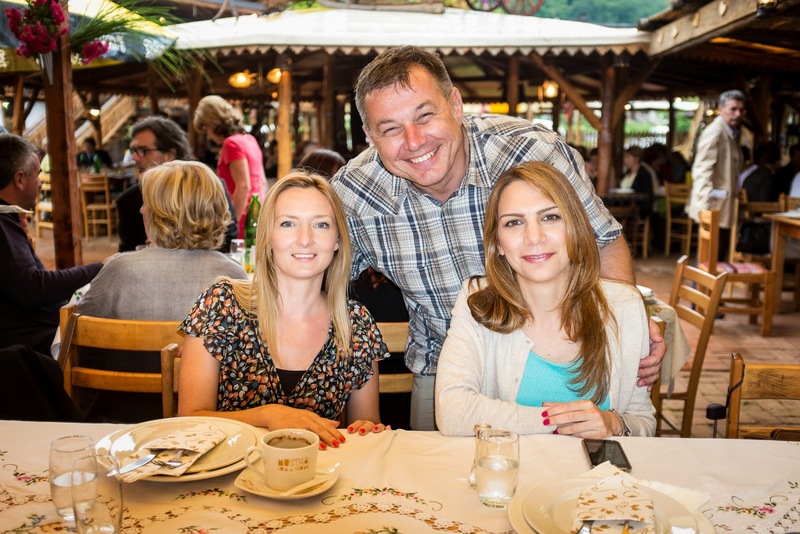 After breakfast at the hotel, the party resumed at 1:00 pm in the town of Guča (pronounced Gucha). Guča is a town of about 2,000 people. 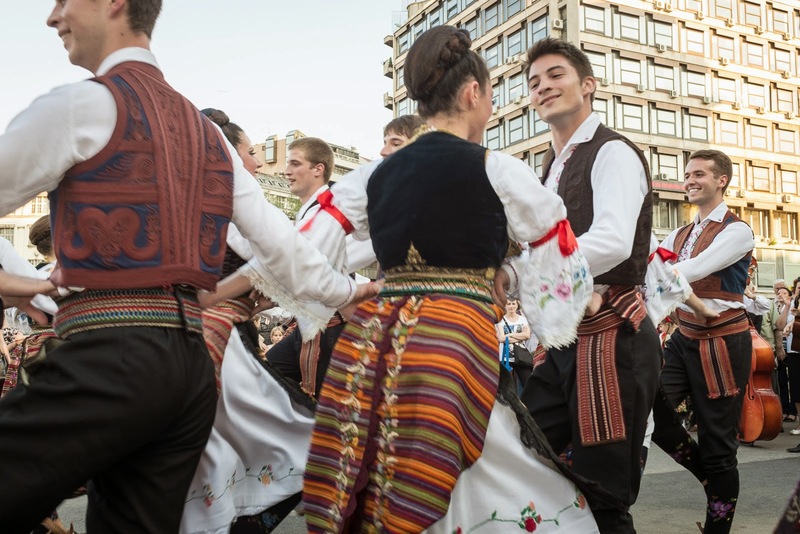 The town is famous for the Guča Trumpet Festival held in August. 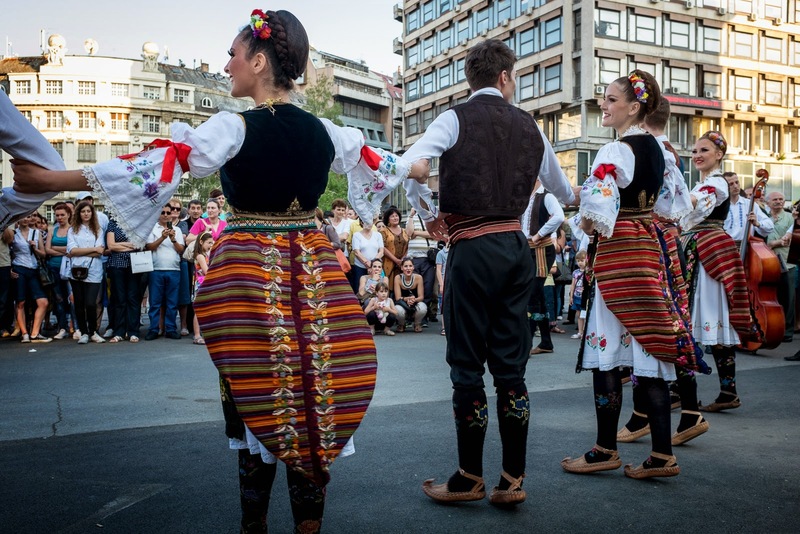 Annually, more than 500,000 visitors (Serbian and international) make the pilgrimage to Guča for the three-day alcohol fueled trumpet festival and competition. 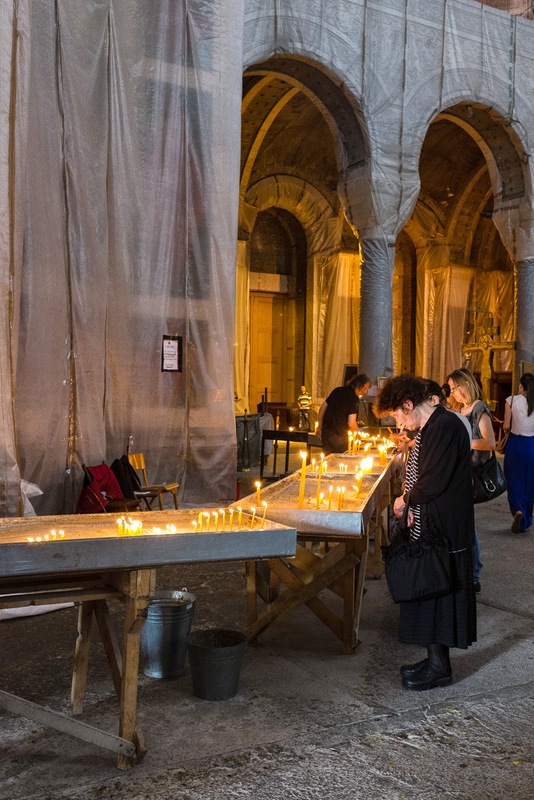 In the Orthodox tradition, even social and business organizations can have patron saints. 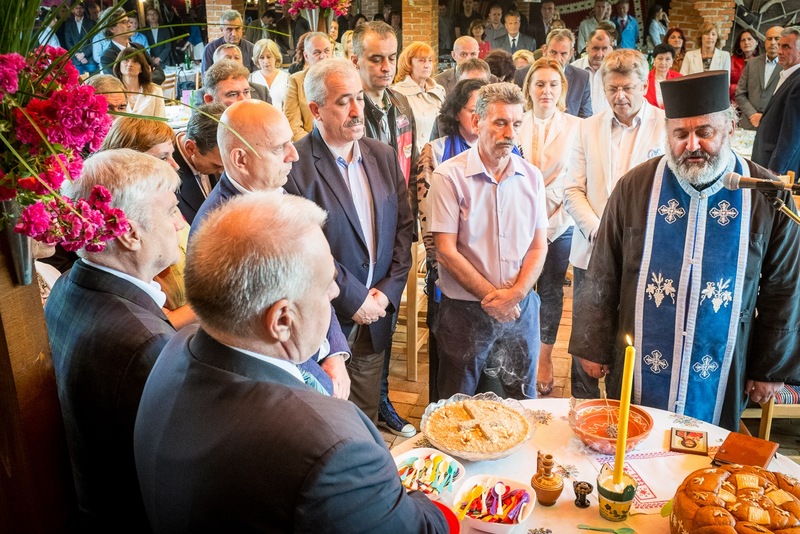 The patron saint of this regional Serbian Bar Association is St. Justinian (the 6th century Byzantine emperor who made up a famous law code which is still the basis of the legal system in much of Europe). 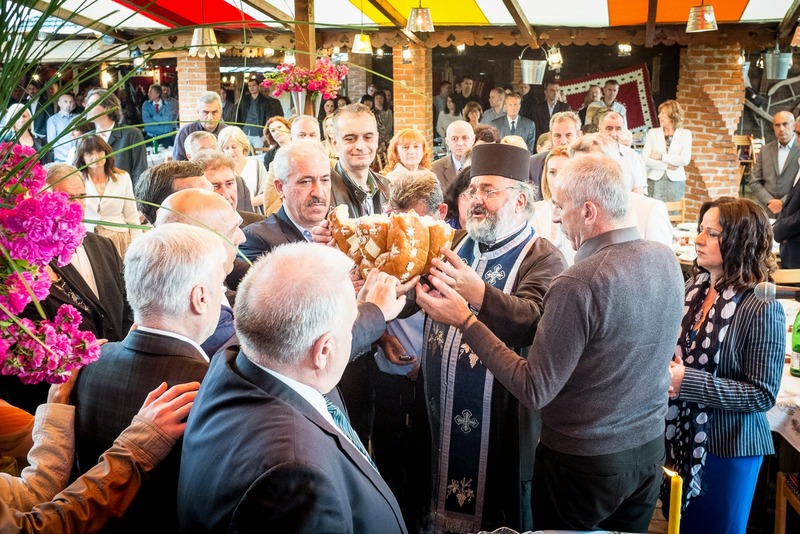 The celebration, a Slava, to honor St. Justinian was to begin with a blessing at a Guča church, but with 300 invited guests, the church came to the party. 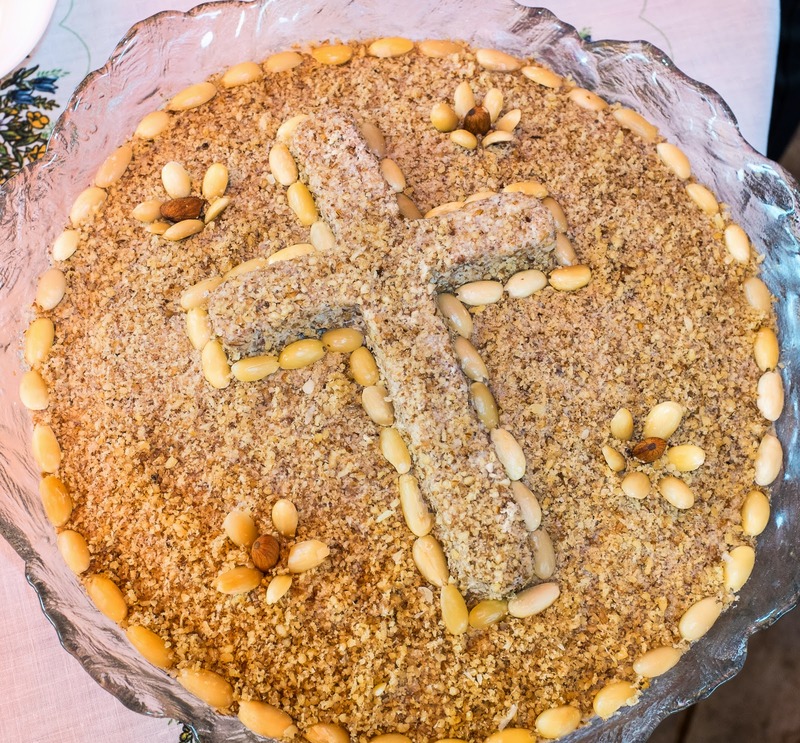 The ceremonial table was set with a slavski kolač (the round of yeast bread) and zhito (boiled wheat with honey and walnuts), red wine, and a special beeswax candle. 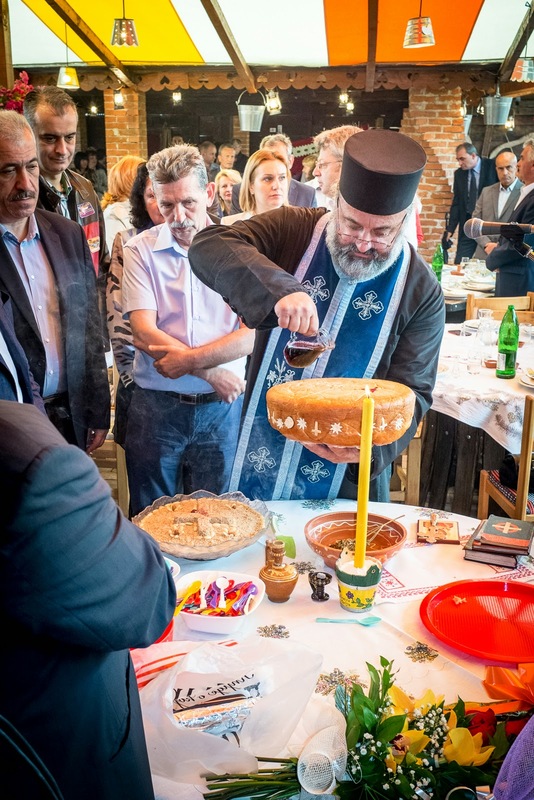 Each item on the table was symbolic: kolač represents Christ as the bread of life, zhito is symbolic of the crucifixion and commemorates departed family members, red wine is Christ's blood, and the candle proclaims Christ as the light of the world. The priest lit the candle and began the solemn ceremony. 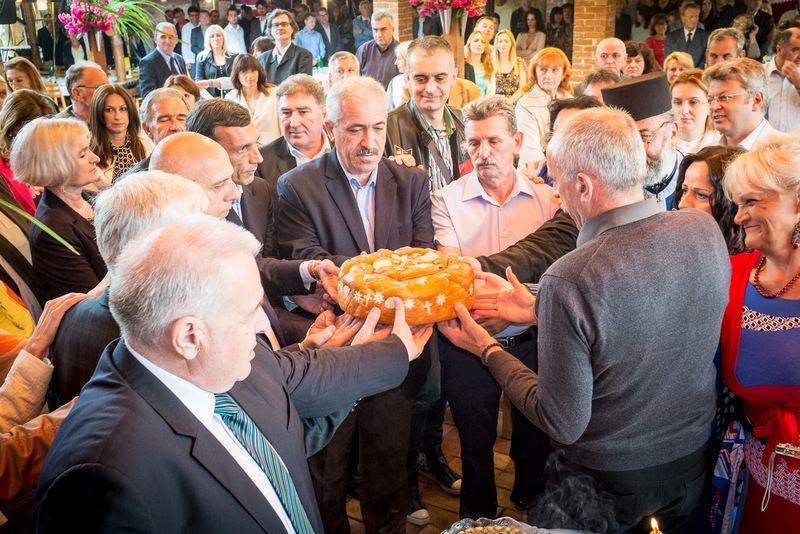 The kolač was anointed with wine and presented to the group while the priest said prayers. The priest retrieved the round and broke it in half. The halves showing the infusion of wine were then held aloft for the faithful to kiss. 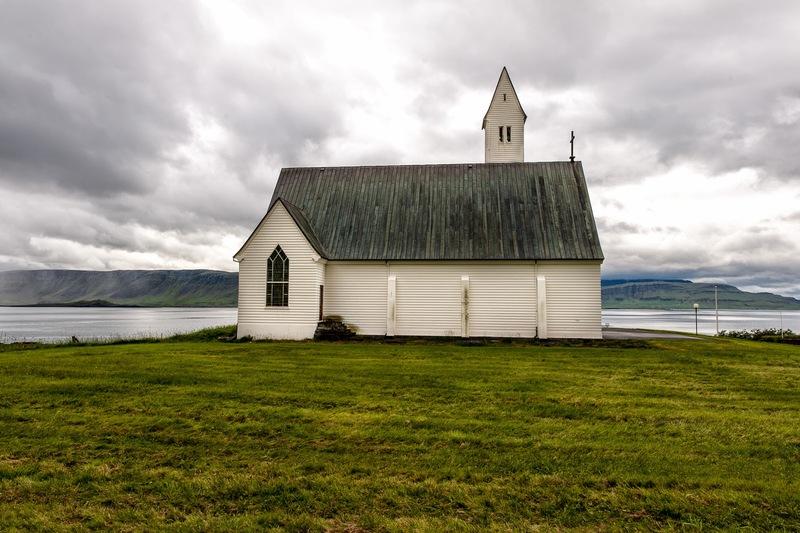 The priest placed the halves back onto the table where one half was broken into smaller pieces and placed in a serving dish. 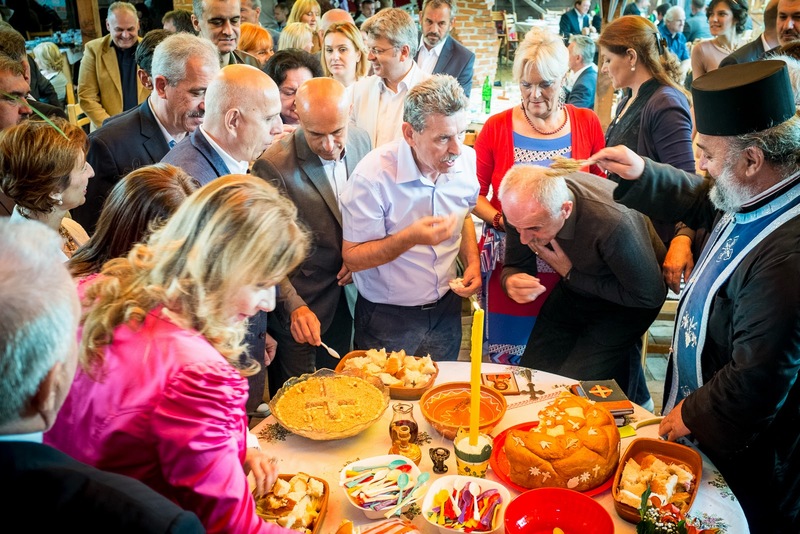 A line formed and guests waited for their turn to take a spoonful of zhito (boiled wheat sweet), a piece of kolač, and receive the priest's blessing. 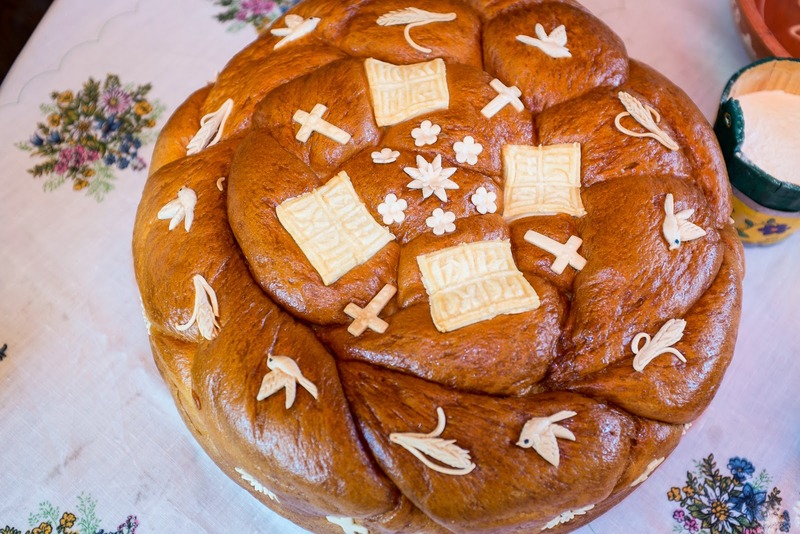 No Slava is complete without a feast and with the religious ceremony out of the way, the feasting began. 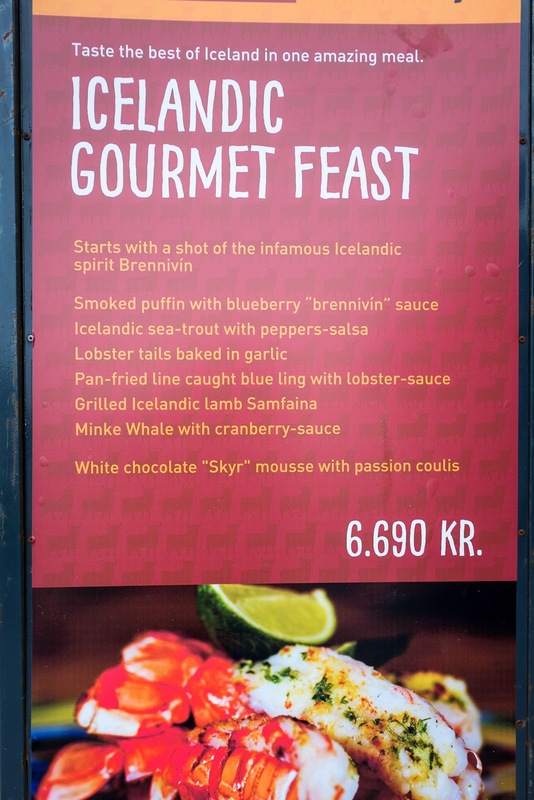 The feast had so many courses. First, aperitifs (plum brandy for us) and plates of local cheeses, kajmak, breads, and smoked meats. Next there was "wedding cabbage", multiple meat courses alternating with palate cleansing salad courses, and wine. 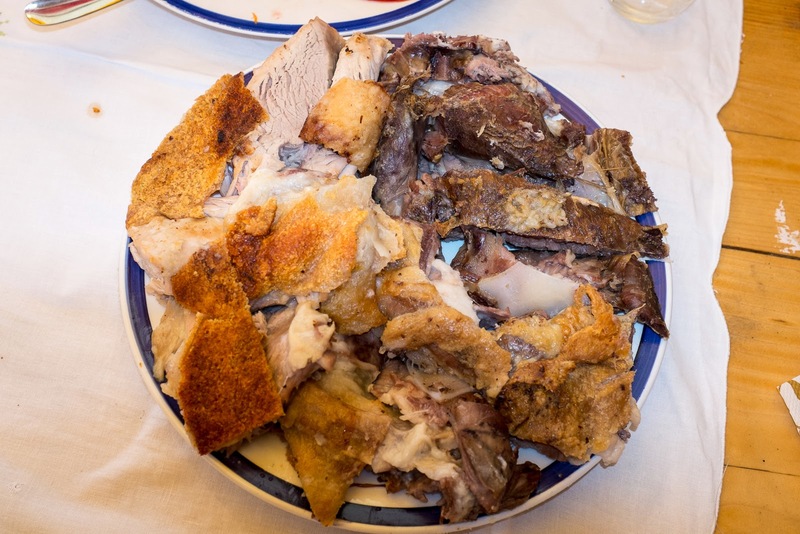 One of the condiments served with the bread was a bowl of "tobacco" cracklings. It looked like threads of tobacco, but it is actually pork cracklings, drained of fat, cooked and fried until the remaining pork becomes thin, brown threads. 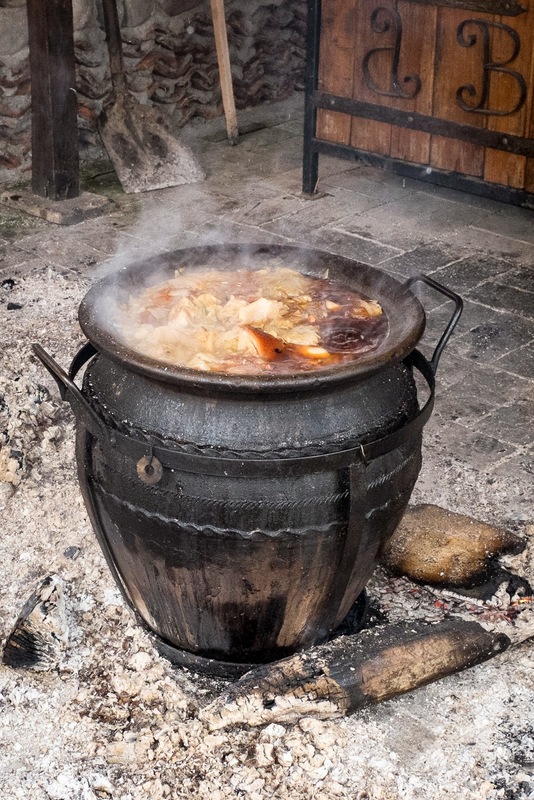 "Wedding cabbage" is cabbage, pork, and lamb layered into large terra cotta pots that are slow cooked for about 10 hours. 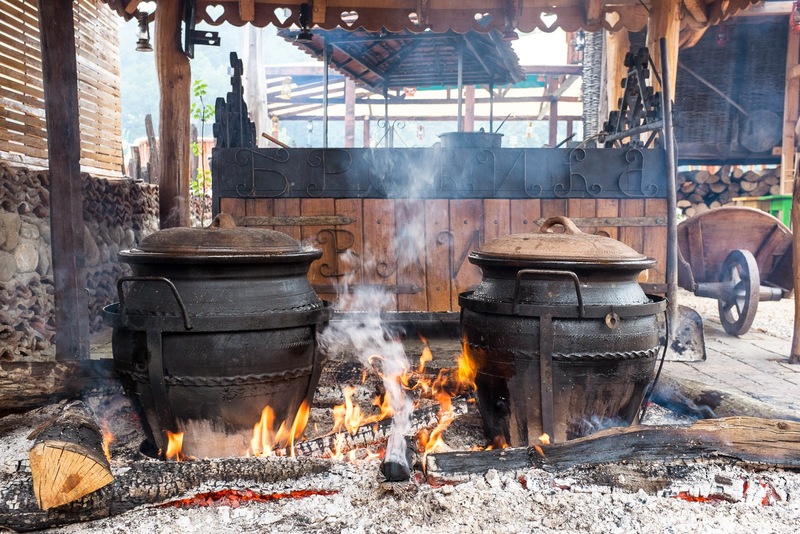 The wedding cabbage pots had already been on the fire for hours when we arrived. 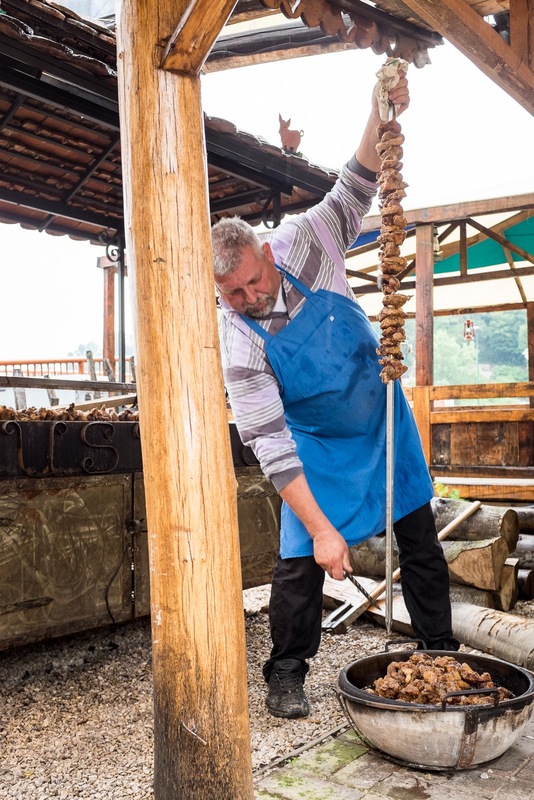 None of the accumulated fat is removed prior to serving the wedding cabbage. It was a delicious fat soaked cabbage/meat dish served with corn muffins. Another meat course was roasted pork and roasted lamb. The roasted pork with its crispy skin--a sinfully delicious taste sensation. The final meat course was served sometime after 8:00 pm and at that point, we were so full we skipped it. The meat is pork scruff (think "scruff of the neck"). It was served with fat infused roasted potatoes. I did eat one of the delicious potatoes. When a potato soaks up that much pork fat, it has a completely different texture. I've never consumed so many varieties of pork fat in my life. Throughout this formidable feast, there was music and dancing. The music was provided by three different bands. Once again, we were impressed that most of the guests knew the words to all the tragic love songs. They didn't lip sync the words, they belted them out. They seemed so excited about each song like they hadn't heard it in years. 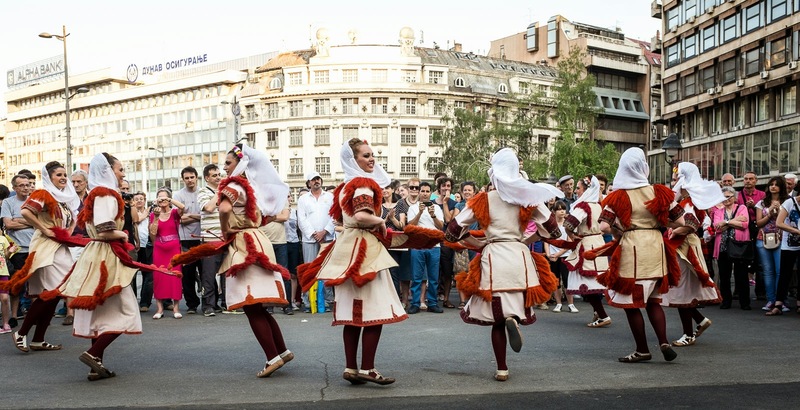 Sasha, our driver, said that the reason everyone knows the words is because every Serb attends at least two similar events (weddings, births, baptisms, Slavas) each month and the bands usually play the same 50 songs at each event. Also on tap was Pink Floyd's "Another Brick in the Wall" and some disco-era songs like Gloria Gaynor's "I Will Survive". 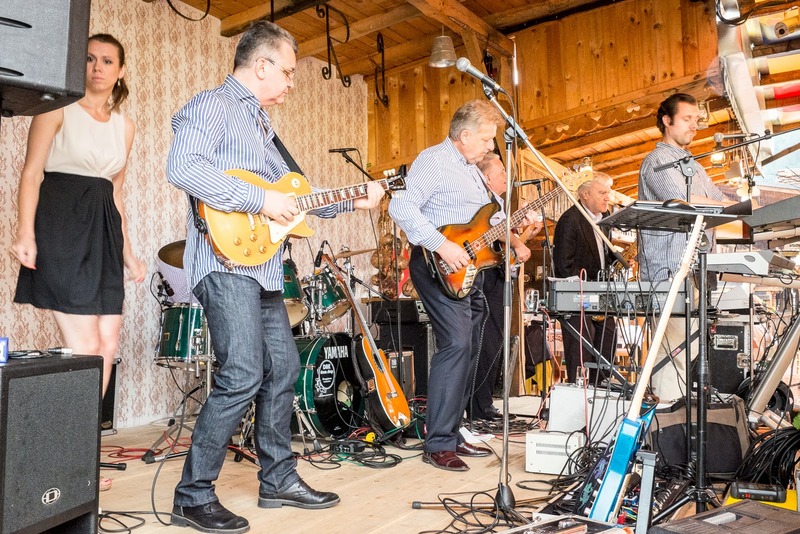 The middle band was "Rockin Law" a group of lawyer musicians. 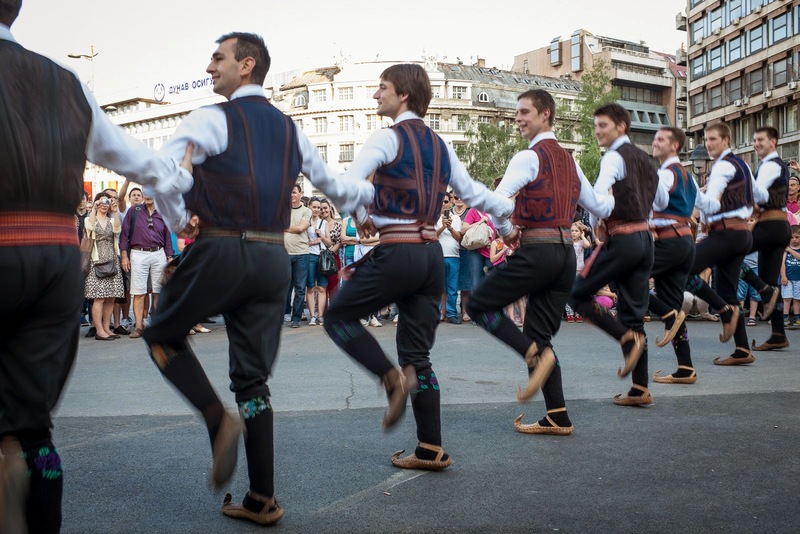 One of the members is the president of the Serbian Bar Association. In the style of the Blues Brothers, they began their set with "Everybody Needs Somebody to Love." They performed quite a few older rock and roll songs like Lil Richard's Tutti Frutti--something that I knew the words to. 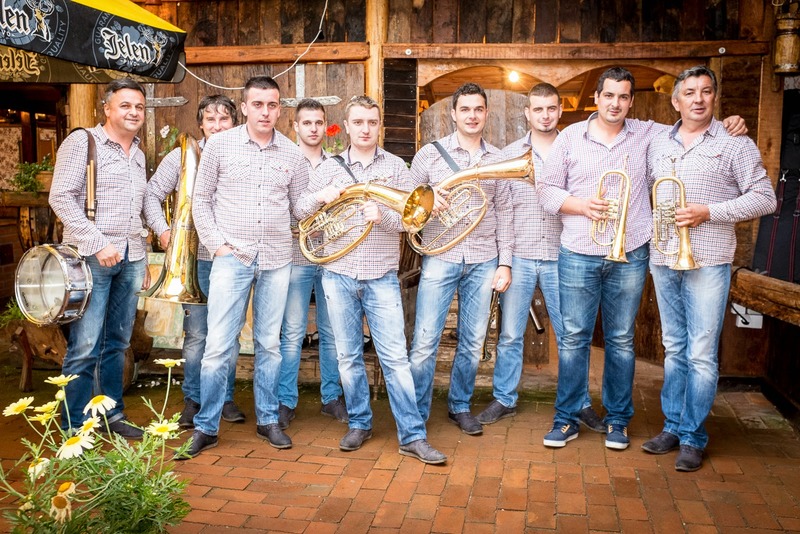 A brass/drum group from Guča took the stage at 7:15 pm and played traditional songs for an hour. The leader is a one-time winner of the Trumpet Festival. 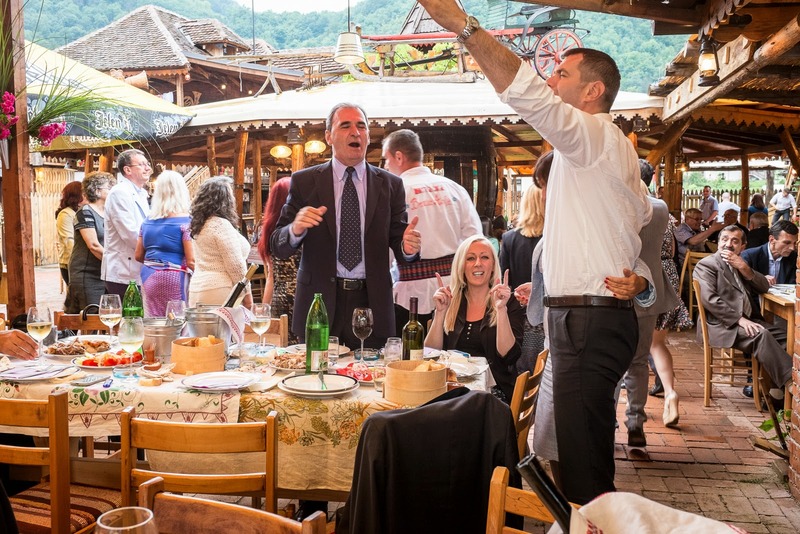 More than six hours into the Slava feast with brass instruments blaring and drums keeping up a body shaking rhythm, it was only a matter of time before someone was dancing on the tables. 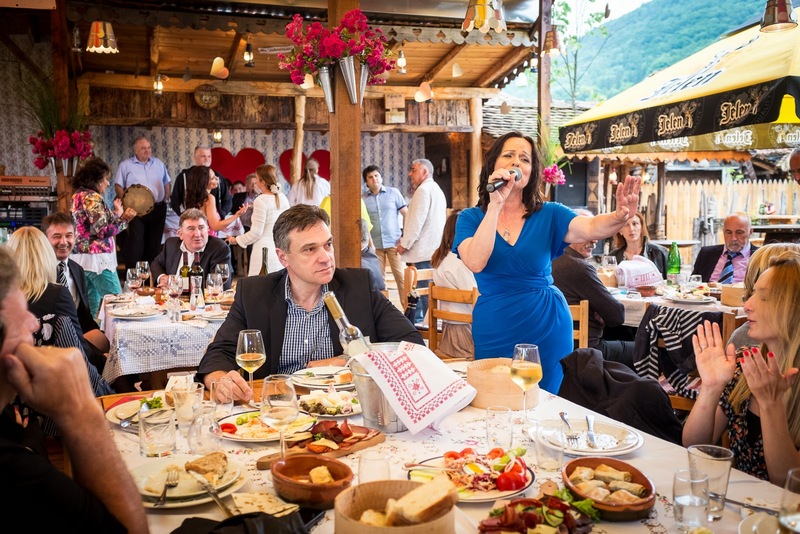 The woman in blue dancing on the table is Jasmina president of the regional bar association and host of the Slava celebration. She was great fun. Security took her off the table and no one else was allowed to stand on a chair or table. 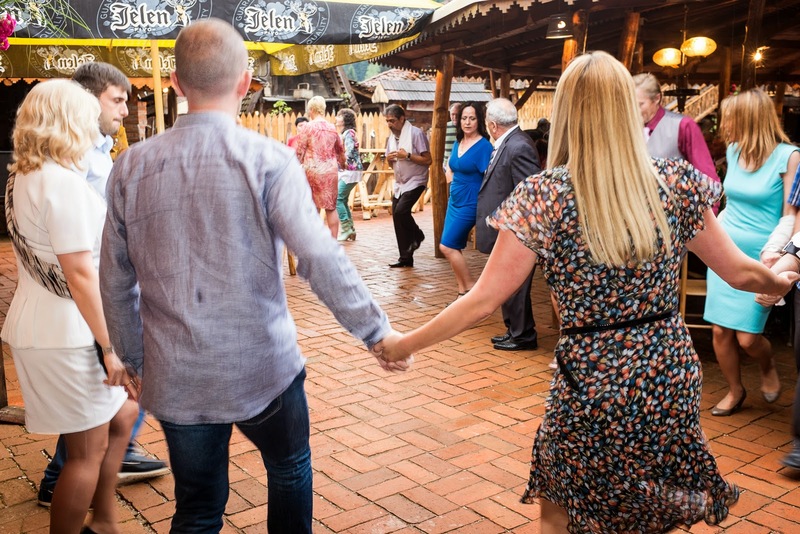 While the trumpets were playing, guests danced the fast paced chain dance called the kolo. The throbbing chain snaked between chairs and tables until the band left the stage. We were invited to stay another night, but Sasha and the two Anas needed to get back to Belgrade which was still 2-1/2 hours north. We left before the party was over, but we had fun. 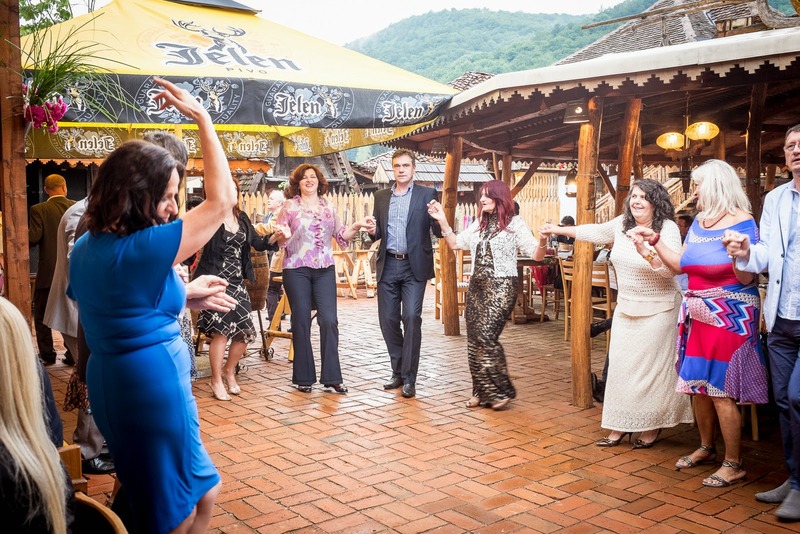 Serbian lawyers really know how to party! One week ago, it was winter in Belgrade. Now it is summer, and linden trees perfume the air. After two days of cool, rainy weather, the temperatures completely changed. No longer do we need coats and my summer clothes finally have a purpose. Dan and I have been doing lots of walking around Belgrade. One night last week after Dan finished work, we strolled (with hundreds of other people) to the Fortress. It was the first good weather day in weeks here, and it was as if people were celebrating its arrival. 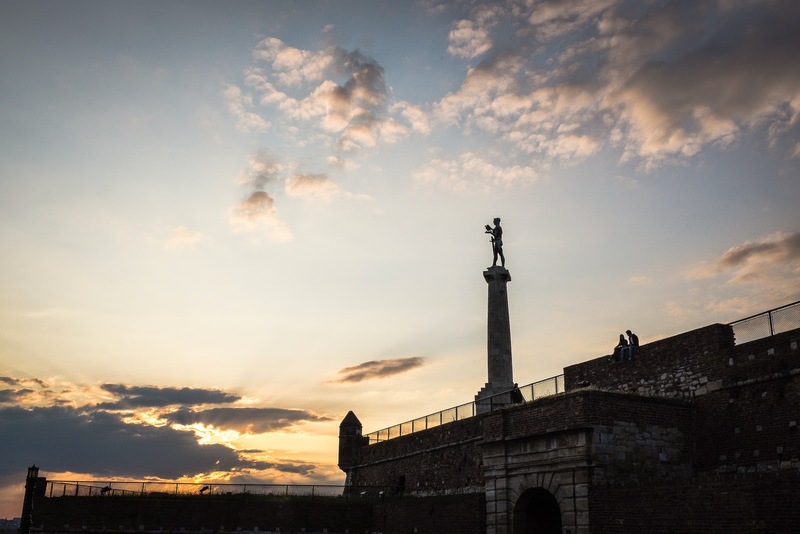 The best place to enjoy Belgrade on a good weather day is at the fortress (Kalemegdan). In Serbian, the city is called Beograd which means "white fortress." The fortress sits high above the confluence of the Sava River and the Danube River. There has been a fortress city on this site since the 3rd century BC. It has been occupied by Thracian, Dacian, and Celtic tribes. It was conquered by the Roman Empire and was later invaded by the Goths and Huns. Possession of the Fortress has flip-flopped between the Byzantines, Avars, Slavs, Bulgarians, the Byzantines, and back to the Bulgarians. In the 12th century, the Fortress became part of the new Serbian state. The fortress was still not permanently in Serbian hands. It fell to the Ottoman Empire and mostly remained with the Turks until 1867 except for a brief stay by the Austrians. The fortress suffered damage in both the first and second world wars. The Fortress is now a park which contains a zoo, several museums, open air art shows, restaurants, chess tables. 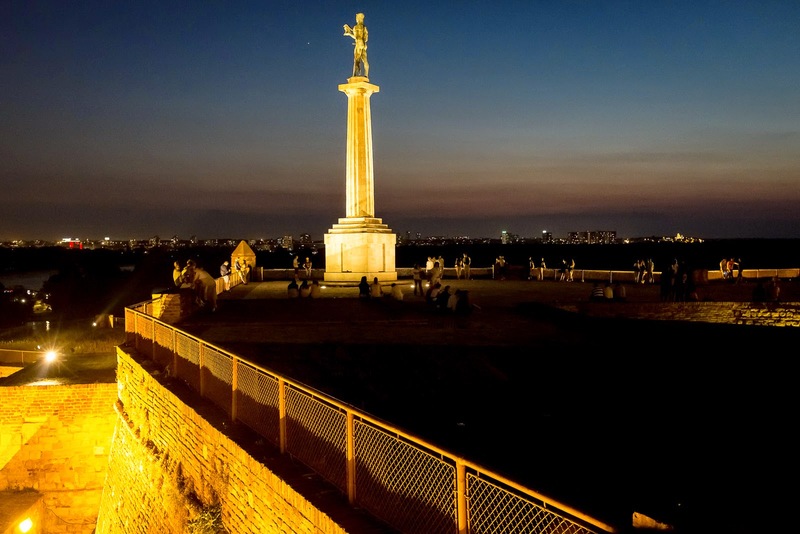 It is probably the most visited site in all of Belgrade. On Saturday, we walked to the not yet finished St. Sava Serbian Orthodox Cathedral. We visited the Cathedral in 2011 and wanted to see what progress had been made. The exterior has been finished since 2009. 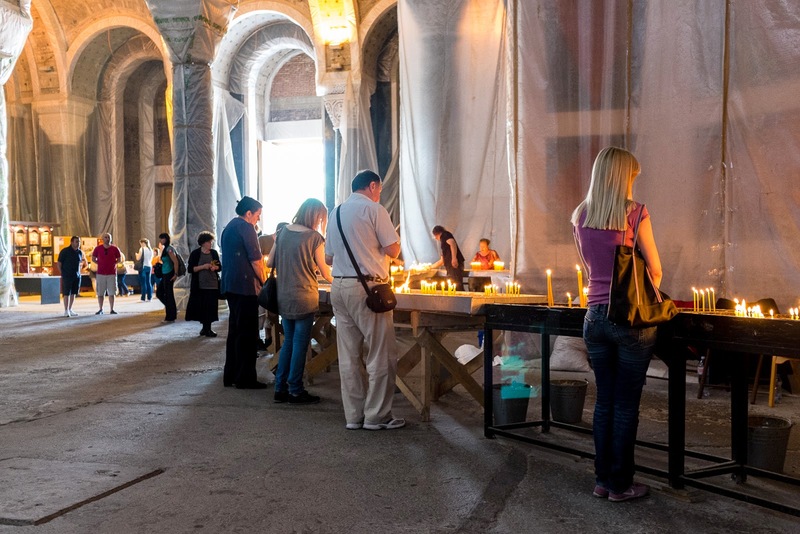 It is the largest Orthodox Church in the world and will be able to hold 10,000 worshipers. 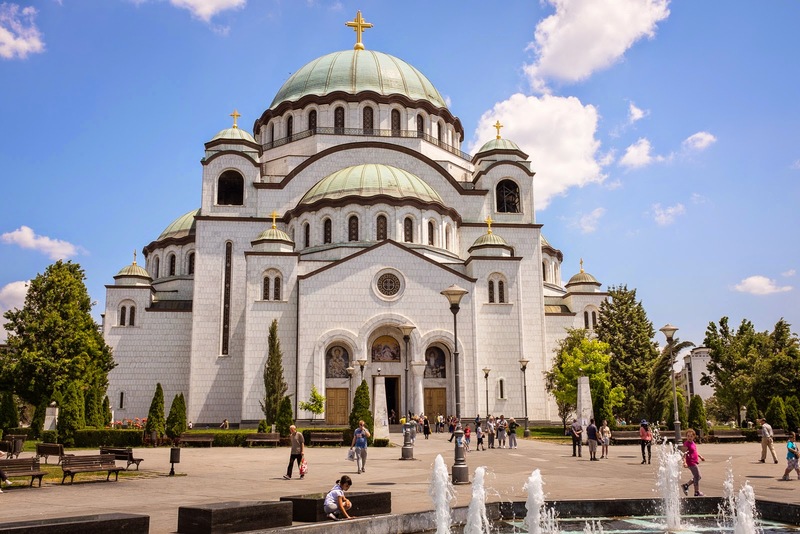 St. Sava is the founder of the Serbian Orthodox Church. 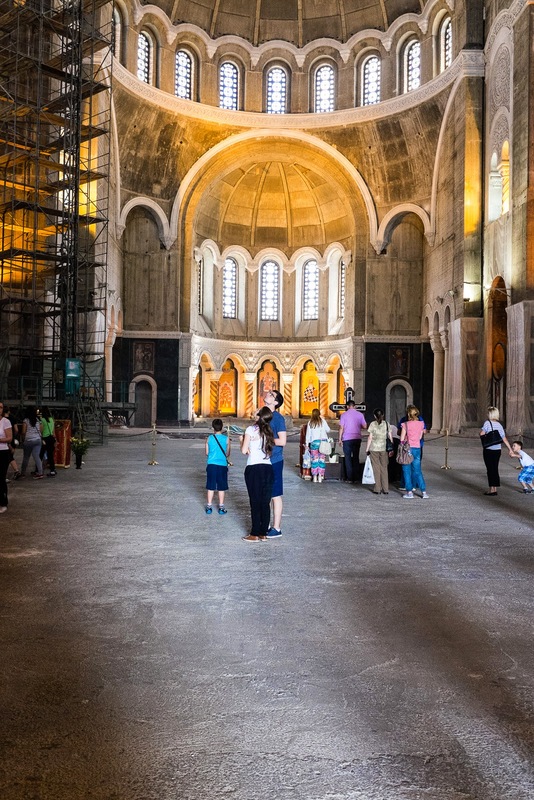 This cathedral is built on the location where St. Sava's remains were burned in 1595 by the Ottomans. In 1935 with the laying of the cornerstone, construction began at this site 340 years after the burning of St. Sava's remains. Construction continued until the WWII invasion and bombing of Yugoslavia by Germany in 1941. In 1985, construction of the building was finally revived. The cathedral is funded only by donations and building is accomplished when money is available. A taxi driver told us that Vladimir Putin has promised to help the Serbian people finish the cathedral. Progress has been made on the interior. Many of the stone walls have been carved with complex decorations. The finished carvings and stone walls are mostly wrapped in plastic to preserve them while the rest of the interior construction continues. The dome and many of the walls will eventually be covered in mosaics. Saturday night was Museum Night meaning that most of the museums were open until about 2 am. For about $5 USD, your ticket gave you access to all of them. Museum Night was originally set for May 17, but was postponed because of the May flooding. Three months of rain came down in just two days. Some 2,000 people are still in shelters. 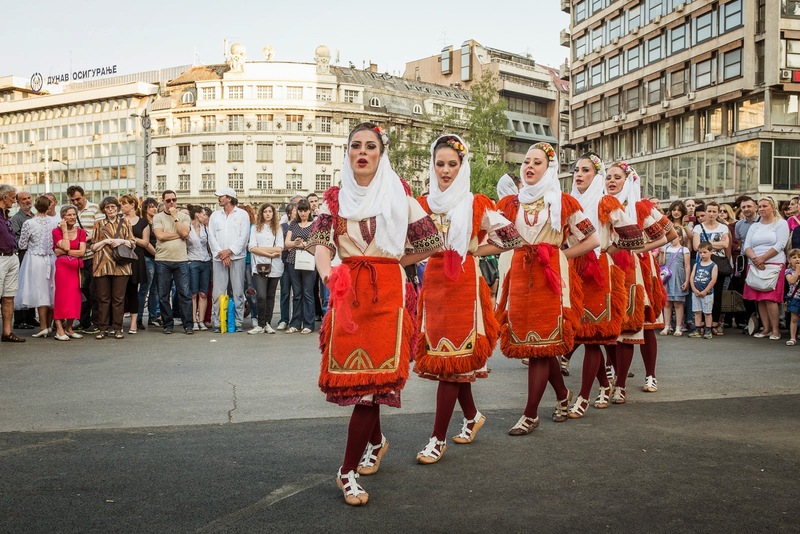 We started Museum Night in Republic Square with a performance by folk singers/dancers. And, we ended at The Victor monument at the Fortress and the view of the city. The statue, The Victor -Protector of Belgrade was installed in 1928. He holds a falcon in his right hand and a sword of war in his left hand. He is gazing toward the horizon keeping watch for the next invaders.